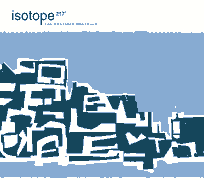 Originally called just “Isotope,” the band changed its moniker to Isotope 217 to avoid confusion with the 70s experimental rock/jazz outfit of the same name. But whether by direct inspiration or after-the-fact realization, I-217’s modus operandi is remarkably similar to its nomenclatural predecessor, specializing in a kind of improvisational, “experimental” jazz, similar to the jazz+rock fusions of the 60s/70s, but updated for the late 90s. Released on Thrill Jockey, the group forms an intermingling triumvirate with Tortoise and the Chicago Underground Duo/Trio/Orchestra as well as a number of other Chicagoland side projects, sharing members, ideas and in some cases, melodies and song titles across multiple records and banners. It also shares those groups’ ethos of merging the compositional prose of post-rock with the expressionism of jazz. Though Isotope 217’s later albums are somewhat less accessible, the group’s 1997 debut The Unstable Molecule features some compelling grooves and is heavily centered around percussion, as is evidenced by Phonometrics below. The note at the top of the page says that the site layout is currently broken in firefox. It turns out that I royally screwed something up while trying to "Improve" Things around here. As a result, I’ll have to recode the site structure and css from scratch. Until then, sorry firefox users. I commend you for your independent spirit, but for now you’ll have to scroll to the bottom of the page to see the sidebars. It was my first exposure to both the glitch genre of music and the concept of a ‘laptop performance.’ For 30+ minutes this Japanese guy with a long pony tail sat calmly behind a table, meticulously twisting dials, pushing buttons and manipulating his powerbook, creating a perfect, swirling mess of sounds… And I was mesmerized by it. By the time he was half way through Sign and those dueling artificial voices had finished their seemingly-never-ending chant, I was hooked. I bought Hoshi no Koe that night after the show and quickly launched an effort to acquire as much Takemura as I could. It was a foolish endeavor; The dude is as prolific as he is obscure (not to mention foreign) and I had a hard enough time tracking down a full discography, let alone much of his music. Eventually, I gave up on that particular tunequest as it proved nearly impossible. Besides, the thing I came to slowly realize about Takemura’s music is that it’s very dichotomic. It’s either so brilliantly clever that you want to shout "Oh my god, that’s awesome!" Or it’s completely and totally unlistenably abstract, the type of compositions that certain people who want to prove their intellectual mettle listen to. A similar phenomenon occurs throughout the genre. However, lesser composers than Takemura lean distinctively toward the latter opinion. In the end, despite the short burst of passion, my affair with glitch was short-lived. As I’ve mellowed with age, I’m not as likely to indulge in the less listenable as I find that my musical tastes are for my own enjoyment and not to impress the kids with some kind of street cred. But Takemura, the man is still fascinating. I took an hour out of the tunequest this morning to listen to an episode of the Sound of Young America, a radio show/podcast that I discovered in January. In all seriousness, I’m not a fan of talk radio as a format; I find that listening to other peoples’ conversations grating. I’d rather be having my own conversations or listening to music. SoYA instantly cut through that avoision. Besides host Jesse Thorn’s nearly-perfect-for-radio voice, the show’s attitude is, well, awesome. In fact, the show bills itself as "Dedicated to things that are awesome" and I can certainly get behind that. I think I fell in love with the show almost instantly one cold, wet, dreary and long Atlanta commute home. The guest was Josh Kornblut, who talked about his one-man Benjamin Franklin show. Now, like any good American, I’m fond of the Founding Fathers for their intellectual, diplomatic and governmental achievements. But the flipside of that adoration manifests itself by thinking that it’s hilarious to place them outside of their historical context, like Ben Franklin besting Jimi Hendrix at air hockey "that’s game, Hendrix". And when Jesse Thorn seemed as excited as I did about Franklin, that sealed the deal right then and there. themodernista accuses me of having a man-crush on Jesse. Unfortunately, with tunequest occupying up almost all of my free listening time, our affair has been scattered and brief. So today’s episode was not only a rare treat, but relevant to my project here because it dealt with the topic of "rock snobs" a phenomenon with which I can claim some familiarity. I freely admit that I have some rock snob-ish tendencies, which definitely shows through my desire to collect rare and obscure music and eschew the pop charts. Though I think the term "snob" is a little inappropriate for me, since I honestly try to keep an open mind about music and try not to be too exclusionary. I’m not ashamed to say that my library contains some Eminem and even one Limp Bizkit song (okay, I am a little ashamed of that one. But it is a decent rock version of the Mission Impossible theme, so it gets bonus points from the Lalo Schifrin association). Of course, I wouldn’t be undertaking the tunequest if my collector’s habit hadn’t gotten out of control. To the appropriately discerning ears, said music can be called "Difficult, but rewarding," an endurance test of sound and noise that for all the effort required, when it’s finished, you can say, "That was worth it." 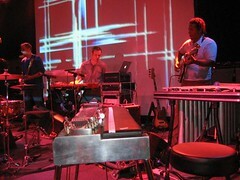 Which, in turn, brings me to Chicago Underground Trio, a group who I’ve categorized as avant jazz. It is the type of music that fits the above description. It is a swirling cacophany of trumpets and drums that takes momentary breaks into recognizable forms of music before beginning the assault again. The musicianship of the performers is not in question–they are affiliated with Tortoise after all–but this record really is a chore to listen to. In the end, I found it difficult but not rewarding. March 16 – 50 songs played. 10 added. a solid 3 hours and 40 minutes in today, which doesn’t seem long enough to have covered all the items below. but a lot of them are singles, just 2-4 songs each, plus i don’t actually list an album here until i’ve played all its songs. i had 6 songs left in the soul coughing show and only the last 2 of sigur ros’ (). so those didn’t make the list until today, despite the fact that most of the songs had been played earlier. also, i know adding more music to my library doesn’t make this task any easier. but i’m always running into new stuff and i don’t want to become musically stagnant. thus, more music. today it was a tortoise show in san francisco 2005.
london symphony performing stravinsky’s "card game"
there are a few albums in a persons life that are emotive of a particular time or place, albums that, when heard, take you back to the feelings you felt when the music was fresh and new. smashing pumpkins’ mellon collie is one such album, taking me back to the winter and spring of my 11th grade year, when nearly-daily bomb threats meant being sent to hang out at the football stadium or skipping school altogether. those were fun times for over-achievers. likewise for hooverphonic’s blue wonder power milk, and particularly the song "renaissance affair." every time i hear that song, i travel back in time to the summer after i graduated college, when i was high on my academic achievements in ad school with big dreams of landing a job a hot agency. that summer was amazing; i had few obligations, plenty of friends (old and new) and plenty of fun. i spent a good deal of time learning capoeira and exercising my creativity. it felt like a non-stop party. while things haven’t turned out as expected (i never did get that ad job) and life has been generally good to me, when i hear that album, i can’t help but think what might have been. A little story about System 7: back in summer of 1997, when only a handful of people knew what "mp3" meant, I ran across a song file called system 7-dizzy spoon on an old-school Hotline server. Being a Mac guy, I was intrigued by a band named after a defunct operating system. And being in the first year of college, I was susceptible to doing the typical college-age experimentation, so download it I did. I remember enjoying the song almost immediately, but because my musical world revolved mostly around rock at the time, I didn’t seek out any other material by the group and left it as a one-off in mt collection. Then a funny thing happened three years later in summer of 2000. I discovered the most excellent german band of the 70s: Can. The last song on their 1972 album Ege Bamyasi is entitled Spoon and I think I nearly had an aneurysm of excitement the first time I heard heard it. I immediately recognized it as the same song as the Dizzy Spoon file. Rather, it was almost the same song. Dizzy Spoon turned out to be System 7’s contribution to the 1997 Can remix/tribute album Sacrilege. Since then, Can has become one of my most respected and admired groups for its innovations and influence and I like to think that I was pre-destined to enjoy their music from the moment I downloaded that mislabeled mp3. As for System 7, the group’s engaging ambient techno continues to entertain me, though 777 is one of their earlier efforts and is a little disappointing. "faydeaudeau" is the standout track and overall the album is decently mellow space out music, even if the composition is overly simple. Speaking of early works, that Tortoise album is a bit difficult to handle, which is probably why I hadn’t listened to it for nearly 4 years. Digest Compendium is a collection of early singles and remixes, where the group seems more experimental, having not yet found their sound. As such, it’s uneven, and at times dull. Event though Tortoise is one of my favorite bands, I ended up removing a handful of songs from my library because I couldn’t see myself listening to them again. however, it did serve to remind me that I’ve been neglectful of the band lately. I had better rectify that soon.